Center Camp 04  Man and Dome 04  Black Rock City 04, Man and Pyramid 03  Man and Lighthouse 02  Making Folding-Time 02. Inspiration: "Spacing Guild Navigators in the novel Dune fold space - to travel through the galaxy. 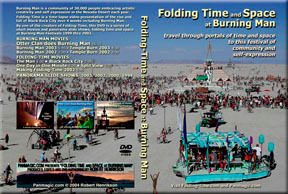 Burning Man Time Navigators fold time  to travel through a time-lapse video of the emergence, flowering and disappearance of Black Rock City. Throughout history, civilizations have emerged, flourished and disappeared, leaving only ruins, pottery and bones under the sands of time as silent witness to something once great. 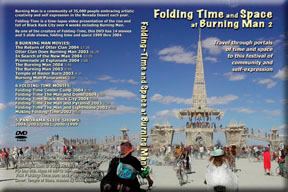 Black Rock City, a self-organizing community, emerges from and returns to playa dust over a time span of four weeks. Unlike empire cities, Black Rock City leaves without a trace. But, for the first time, the life cycle of this amazing organism has been captured for posterity and folded into compressed time for easy viewing. 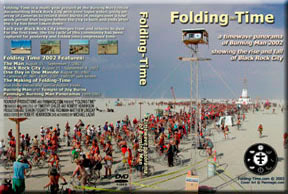 Folding-Time Trailer: See an introduction to Folding-Time in this 2:15 minute movie.